AFR Direct Master Warehouse Distributor - All AFR Products Available. AFR 210cc SBC Eliminator Cylinder Heads. AFR's 210cc "Race Ready" and "Competition" heads feature 100% CNC ported intake, exhaust & chambers, A356 aluminum castings and high quality components throughout. Recommended for race applications and aggressive street/ strip builds up to 400 cubic inches, operating up to 6500- 6800 RPM. Component upgrade and machining options are available to customize AFR Heads to your specific build. There are many different options available for AFR heads, please view the details section below for the details on these heads. For the many other AFR heads available, and options such as upgrading springs or retainers. The Most Powerful Standard Racing Head Available! These reasonably priced AFR 210cc intake port small block Chevy angle plug cylinder heads are available in two stages of performance. The Race Ready version features 100% CNC ported intakes while the higher flowing Competition version features 100% CNC ported intakes with greater detail and higher flowing exhaust ports as well. Both come with 100% CNC ported 65cc or 75cc combustion chambers and 80cc exhaust ports with a 3/4 thick head deck (ideal for nitrous or blower applications). Standard valves are lightweight 8mm 2.080" intake and 1.600" exhaust with AFR's hardened ductile iron interlocking valve seats. The exceptional flow characteristics, 23° valve angle, and standard valve spacing make this the perfect head for 350 to 400 cid engines in bracket drag cars, sportsman oval trackers, and highly modified street class cars operating between 3000 and 7500 rpm (higher rpm ranges possible depending on combination of parts). The 210cc aluminum cylinder heads are available in either standard or spread port exhaust. No special parts are required. Dual valve cover bolt pattern is standard. The exhaust ports are raised. 250 over a standard GM L-98 cylinder head. Note: 2.080 valves will require aftermarket pistons notched for valve clearance. 710 lift AFR# 1050 - 210cc Heads, Angle Plug, Standard Exhaust, 75cc. 710 lift AFR# 1059 - 210cc Heads, Angle Plug, Spread Port Exhaust, 65cc. 710 lift AFR# 1103 - 210cc Competition Package Heads, Angle Plug, Standard Exhaust, 65cc. 710 lift AFR# 1100 - 210cc Competition Package Heads, Angle Plug, Standard Exhaust, 75cc. 710 lift AFR# 1106 - 210cc Competition Package Heads, Angle Plug, Spread Port Exhaust, 65cc. 710 lift Note: 2.080 valves will require aftermarket pistons notched for valve clearance. Due to the large demand for AFR heads, AFR currently takes 3-4 weeks to build a set of heads. 100% CNC Ported Combustion Chambers 100% CNC Ported Exhaust Ports 100% CNC Ported Intake Ports Competition 5-angle Valve Job. 8mm Bead Lock Intake Valve, 2.080" x 5.000" Overall Valve Length. 8mm Bead Lock Exhaust Valve, 1.600" x 5.030" Overall Valve Length. PAC Racing Spring 1.550 OD Solid Roller Dual Valve Spring, 220 lbs on seat. Manley 10° Steel Retainers 1.500 O. D x 1.120 I. 10° Bead Lock Valve Keepers. D Locator 1.550 O.
Ductile Iron Intake Valve Seats 2.200 O. D x 1.750 I. Ductile Iron Exhaust Valve Seats 1.696 O. D x 1.325 I. Specifications, Features, and Optional Supporting Components. 2.240" H x 1.310" W 3/8 Radius. 1.420" H x 1.545" W. Max Valve Spring Pocket Machining. 006 per cc 60cc Maximum. 009 per cc 55cc Maximum. Race Ready: 2.100 sp in, Comp 2.115 sq. Note: Angle mills might require a. Exhaust Port Gasket, Fel-Pro #1405. Head Gasket, 350cid Fel-Pro #1003. Head Gasket, 400cid Fel-Pro #1014. Important: Do not port match you intake manifold to any Fel-Pro gasket as it does not precisely match AFR heads. Note: Milling head deck will affect flow numbers. We have AFR heads to fit almost every performance application! - UPS Worldwide Expedited - 3-9 days GUARANTEED! Com) - UPS Worldwide Saver - 1-5 days GUARANTEED! We do not lower invoice values since it is a violation of US and International custom laws. Let us work to resolve your problem so everyone is happy. Suite D7 Costa Mesa, CA 92627. 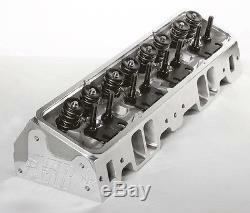 The item "AFR SBC 210cc Aluminum Cylinder Heads 400 434 CNC Ported Small Block Chevy 1054" is in sale since Wednesday, March 09, 2011. This item is in the category "eBay Motors\Parts & Accessories\Car & Truck Parts\Engines & Components\Cylinder Heads & Parts". The seller is "treperformance" and is located in Costa Mesa, California.